Does your dog like to run away? Like, constantly? Can he get over the fence you installed specifically to keep him inside your yard? Are you worried that he’s going to get hurt? Worry no more! We have a solution. We did plenty of research to help you find the best wireless dog fence. 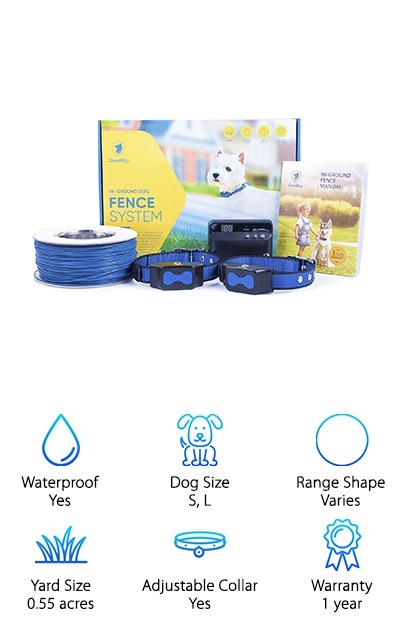 But before we jump into our wireless dog fence reviews, let’s look at the features you need to know about when shopping for one. Waterproof: If your dog is going to be outside, there’s a good chance they will get wet. That’s why all of the receiver collars are waterproof. Transmitters, on the other hand, are not all waterproof. That varies by product. Dog Size: Most of these fences can be used on small, medium, and large dogs. Some have universal collars, some you’ll have to get the right size. The only dogs that these fences are not approved for are the toy breeds. Range Shape: Some of the transmitters only work in a circle shape. On the other hand, a lot of them come with wire that you can lay out in any way you want. If that’s the case, options are unlimited. Yard Size: Each of these can cover a certain number of acres. If you need more space for your dog, there are a lot of kits that are expandable simply by adding more of the fencing wire. Adjustable Collar: Some of the collars can fit any dog in the size range. Others will require you to get a different size depending on the size of the breed and the texture of the breed’s fur. Warranty: Warranties are necessary, especially on a product like this that’s electronic and going to be exposed to your pet and the outdoors. The longer, the better. And here’s some good news: some even offer limited time money-back satisfaction guarantees. Now that you know a little more about what to look for when you’re in the market for a wireless dog fence, you’re ready to dive into our wireless dog fence review. Here’s the deal: the first 2 items are our top and budget pick. This is a great place to start if you don’t have a lot of time, but we hope you can stick around to learn more about the products rounding out our top ten. Let’s go! There are a few things that made this PetSafe Wireless Fence stand out as a best wireless dog fence system. The easy set-up was the first thing. 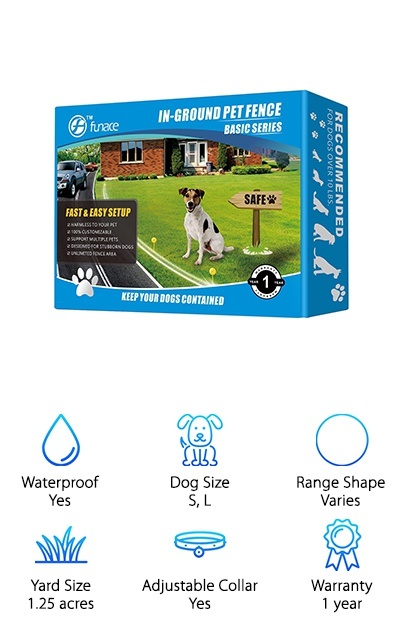 We also really liked that there are 5 levels of correction, including a training mode that only plays a tone so your dog can learn the boundaries without any physical correction. And check this out: the collar works for any dog over 8 pounds with a neck size of 6 to 28 inches. They should also be older than 6 months and able to follow simple commands. That’s a pretty wide range! This system is portable, too. Yes, we said portable. Know what else that means? You can use it at home without having to dig up your yard. Our budget pick is really versatile and will work for most dogs. Specifically, the collars and settings can be adjusted for dogs that weigh more than 10 pounds. This one comes with 955 feet of solid copper wire that you set up in your yard. What’s good about that? Because the wire is flexible, you can basically make any shape you want! Put it around the perimeter of your whole yard, protect your garden and flower beds, or keep your dog in the acre of land that’s closest to your house. This kit covers 1.2 acres, but you can get additional wire and use one transmitter to cover up to 5 acres. Here’s the best part: it comes with a lifetime replacement warranty. What have you got to lose? 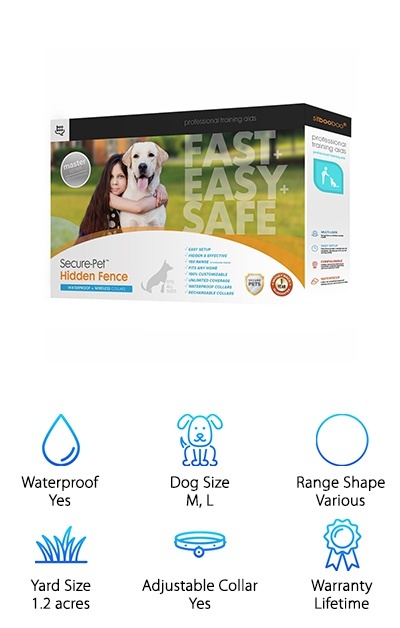 One of the reasons we chose this GoodBoy Invisible Fence as one of our picks for best wireless dog fence is because it’s suitable for a lot of breeds and a lot of situations. Here’s the deal: you can use the boundary wire to make any shape you want. Set up one boundary, boundaries inside of boundaries, or corner off your garden to stop your dog from digging it up. Plus, you can use it underground or above ground. 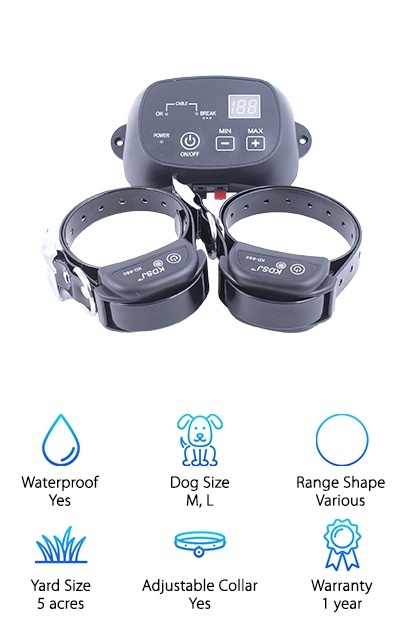 There are 5 levels of corrections and the collars are adjustable. 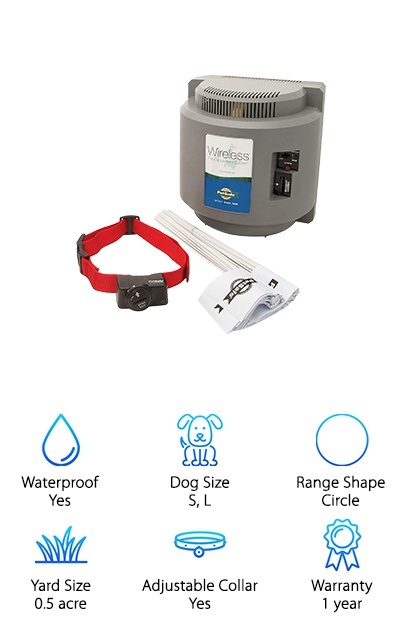 This is a great choice to use with any dog that weighs more than 14 pounds. It’s also really easy to install - no special tools needed! Plus, it has a built in detector that warns you of issues with the wire. If you’re looking for a system that supports multiple dogs, take a closer look at the FunAce Wireless Fence. It works with all dogs over 10 pounds. While it only comes with 1 collar, it’s capable of supporting multiple dogs by adding more collars. How many dogs? Unlimited. However many dogs you have, this one can support them all. Here’s another awesome thing about the collars: they’re rechargeable. You don’t have to keep buying batteries. This one also has an anti-over shocking design that limits the shock that gets delivered when your pup is outside of the boundaries. Here’s how it works: it shocks and beeps for 18 seconds then beeps for 34 seconds. It runs through this cycle 3 times, only delivering a total of 54 seconds of static shock. 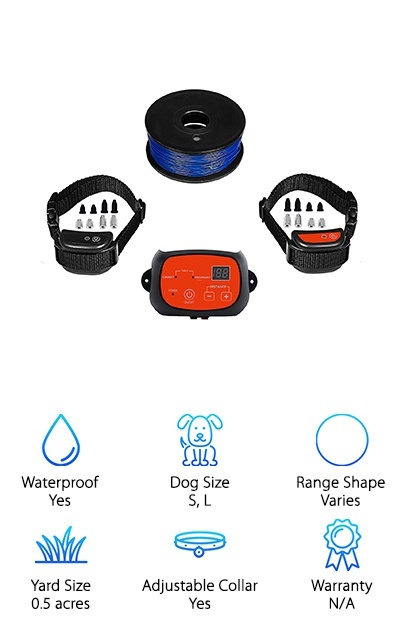 This best wireless fence for dogs also has a training system built in. What does that mean? 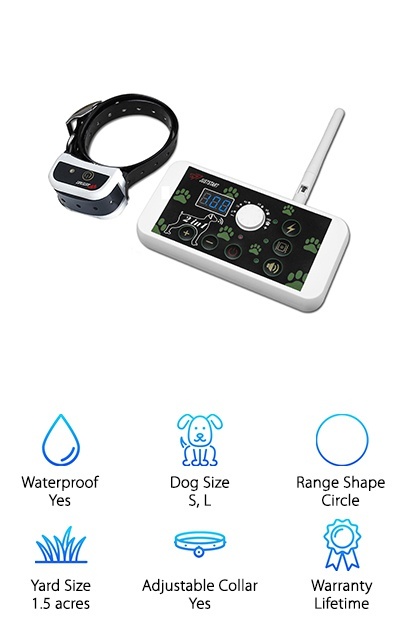 Well, in addition to keeping your dog in a restricted area, you can also change the signal intensity and deliver shocks, tones, or vibrations on demand to correct bad behavior. This is another system that’s great for houses with multiple dogs. Just purchase additional collars and you can keep all your furry friends safe in the boundaries of your yard. It’s good for all different sizes of dogs, too as long as they weigh between 10 and 160 pounds. This one comes with a nice warranty, too. Not only do you get a full year protection, they also offer a 60 days money back or replacement guarantee, no matter what the reason. 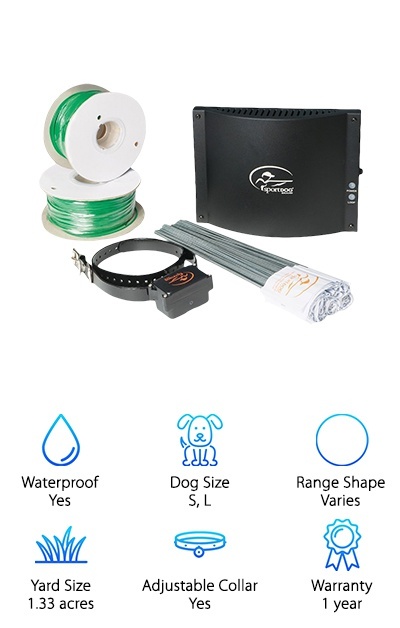 This easy to install best wireless electric dog fence comes with 1000 feet of wire and 100 flags to mark the boundary. Get this: if you need it to be bigger, you can purchase additional wires and flag kits because the transmitter can cover up to 100 acres! What we really liked about this one is that you can choose the correction levels that are appropriate for your dog’s temperament. The transmitter is mountable and has lightning protection to protect it during bad weather or even from a power surge. There’s also an alarm to let you know if there’s a break in the underground wire. That’s not all. The collars are super convenient, they run on a standard 9-volt battery that can last anywhere from 6 to 12 months. This wireless fence works through a wifi connection and is super easy to install. One of the best things about this kit is that the collar is really adjustable. In fact, it’s suitable for dogs with neck sizes ranging from 3 - 25 inches. That said, it’s important to adjust the collar so the metal contacts are up against your pup’s skin for the system to work appropriately. When your dog reaches the boundary, the collar will first vibrate. If he keeps going, it will give a 2-second shock but this is adjustable on the transmitter dial. You actually get to choose from 3 modes: electric shock, vibration, and sound. This kit also makes an excellent training device because you can use these modes to try to get rid of bad behavior. Easy installation is only one of the great things about this invisible dog fence from Goodboy. First of all, it’s good for most dogs as long as they weigh more than 16 pounds (sorry, toy breeds). It comes with 2 rechargeable collars and covers 0.55 acres. If you need more space, you can get extra wire and additional collars that work with the same transmitter. With the additional equipment, this brand can cover up to 5 acres. The wire is heavy-duty and the whole system is waterproof. What does that mean for you? Less to worry about! No need to fret over lightning strikes, sporadic collars, or underground wire breaks. You’ll also get a quick-start guide that will help you troubleshoot any problems you might encounter during installation. 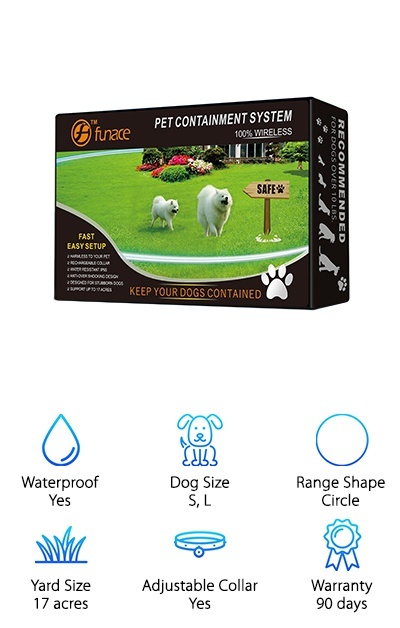 This FunAce system can support unlimited collars so you can keep all your pups safe and sound in your yard. It’s a great pick for any dog over 10 pounds, too. What is so unique about this system is the built-in filter that blocks out any interference from electronic devices. What does that mean for you and your dog? No random shocks or glitches. This will keep your dog from getting confused, resulting in faster and more effective training. This kit comes with 2 collars so it’s perfect if you have a 2 dog household. And get this: in addition to the warranty, you also get a 30-day no-risk guarantee. If you don’t love it, just return it within 30 days for a full refund. This electric dog fence works by first sending a warning beep. If your dog continues to advance beyond the boundary, it will give shocks that get stronger and stronger until your dog returns to the permitted area between the boundaries. 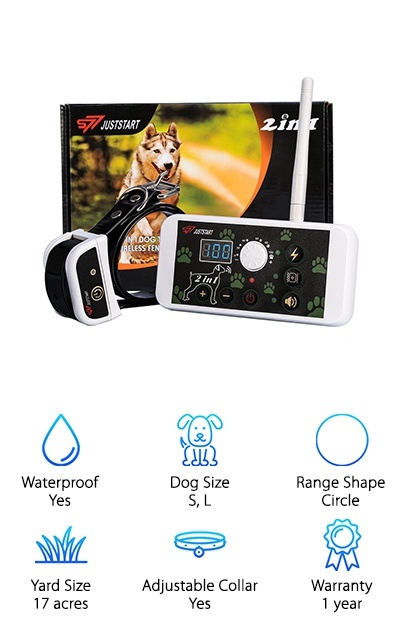 It works for dogs weighing anywhere from 10 - 120 lbs, which is a really big range! Guess what else? It comes with 2 collars so if you have 2 dogs of almost any breed, this kit will work for both of them. You get 656 feet of wire so you can customize the outline to the edges of your yard or continue it around your garden or flowerbeds to keep them protected, too. Just make sure you leave your pup large enough areas to pass through and you’re good to go!